In southern California, one of the most treasured outdoor activity regions is known as Palomar Mountain. This area of over 1,600 acres includes mountainous terrain, forests, camping, fishing, and is especially suited for hiking. This article will cover many of the most attractive features of Palomar Mountain including activities, hours of operation, information on making reservations, and even a brief but interesting history of how the area came to be a state park. If you’d like to learn more about exploring this area, then read on to get a brief outline of what is available. Afterward, you can follow the web site link or call the phone numbers if you would like to learn more information or make reservations. Located in north San Diego County in southern California, you’ll find the serene landscape known as Palomar Mountain State Park. Known for its abundance of conifer trees, such as firs, cedars, and pines, the elevation averages around 5,000 feet. Nights are typically cooler because of the location above sea level. Expansive views can be seen from many of the peaks. Of particular note are the views of the ocean and desert. This park includes many accommodations for camping and hiking. Within a particular region known as the Doane Valley Campground, there are 31 campsites within the park. Three of the parks include accessibility for the disabled. Amenities include piped drinking water, hot showers, flushing toilets, tables, and fire rings. Trailers, vans, and RVs can be accommodated up to 21 feet in length. There are also grounds for tent campers. Food can be purchased or cooked yourself. However, it’s important to note that you cannot gather fire wood from the camp grounds themselves. You must bring your own or purchase it on site. There are many hiking trails within Palomar Mountain. However, it should be noted that trails are available for hikers only. While cyclists may be left in the cold, this means that the park is a hiker’s paradise. Some of the more challenging hikes include thick coniferous forests. There are also an abundance of oak trees which can provide shade during a long hike. 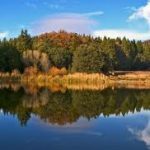 If you’re into outdoor activities, one of the more practical and enjoyable things to do at Palomar Mountain State Park is fishing. There is a pond within the park called Doane Pond. The park stocks the pond mostly with trout. Fishing is usually good during most of the seasons except for fall. It’s important to note that fishing is only allowed during the day, and you must possess a valid California fishing license. The Doane Valley within the park was once an area where natives known as Luiseno Indians once hunted, fished, and gathered seed crops. In 1798, a mission was established by the Spanish called Mission San Luis Rey. Near the beginning of the 1880s, a man named George Edwin Doane entered the area and constructed a log cabin. Today, that area is now the Doane Valley Campground. Some of Doane’s apple trees are still alive even today. There are four apple orchids inside Palomar which go back to that time period. It was in the early 1930’s when the 1,683 acres were designated for the purpose of a state park. The picnic area is open 8:00 AM to sunset. If you’re planning on cooking, firewood must be brought with you because the park does not allow anyone to gather plant material or dead wood on site. You can also purchase fire wood from the park employees.